Workman Publishing Company, 9780894807626, 576pp. Steven Jenkins is our foremost cheese authority--in the words of The New York Times, "a Broadway impresario whose hit is food." Now, after years of importing cheeses, scouring the cheese-producing areas of the world, and setting up cheese counters at gourmet food shops, he's decided to write it all down. 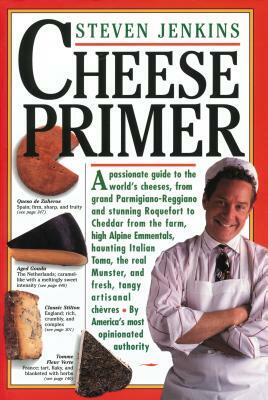 Full of passion, knowledge, and an expert's considered opinions the cheese primer tells you everything you need to know about the hundreds of cheeses that have, in the last few years, become available in this country. Region-by-region, he covers all the major cheeses from France, Italy, Switzerland--the top tier of cheese-producing countries--plus the best of Britain, Ireland, Spain, the United States, Austria, Germany, and other countries. Along the way he tells how to pick out a healthy Pont l'Eveque; why to reconsider the noble Fontina for more than just cooking; how to avoid those factory-made chevres; why to seek out the sublime Vacherin Mont d'Or; and how to start exploring--Bleu de Bresse, Cabrales, Crottin de Chavignol, and so on. A complete primer, it includes information on the best ways to store and serve cheese, including which wines to serve alongside them; how to orchestrate a proper cheese course; and the unimportable cheeses to look up when abroad.